Just back from my first Fiber In the Forest workshop, hosted by the Eugene Textile Center. It was great fun and I met some super great ladies! All were very talented and willing to share their knowledge, most were involved in some aspect of fiber. A great experience for me and I made some new fiber friends. I took a workshop called Color Camp – 3 ways to dye with Janis Thompson. It was great fun. Since I am a natural dyer – my favorite was the Eco Scarf day. 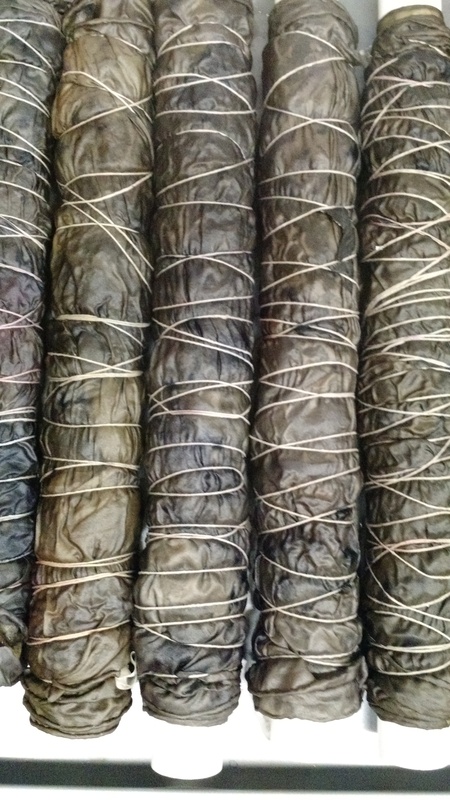 The sad part is I can’t reveal my scarves until Wednesday – but here is a picture of what our scarves looked like after coming out of the steam bath. I plan to overdye mine with Indigo – so I will show the before and then post later after they have cured and dried. More tomorrow with colorful pictures of some of our results using acid dyes and cellulose MX dyes. This entry was posted in Uncategorized and tagged eco dying, fiber, Indigo, natural dying, roving, scarf, yarn. Bookmark the permalink. I tried to sends comment but can’t figure it out …will ask Emily when I get home tonight. Trying to keep iPad usage to 10 min. On work mornings…exciting..can’t wait til wednesdaynfor the unwrapping..they look like cocoons.